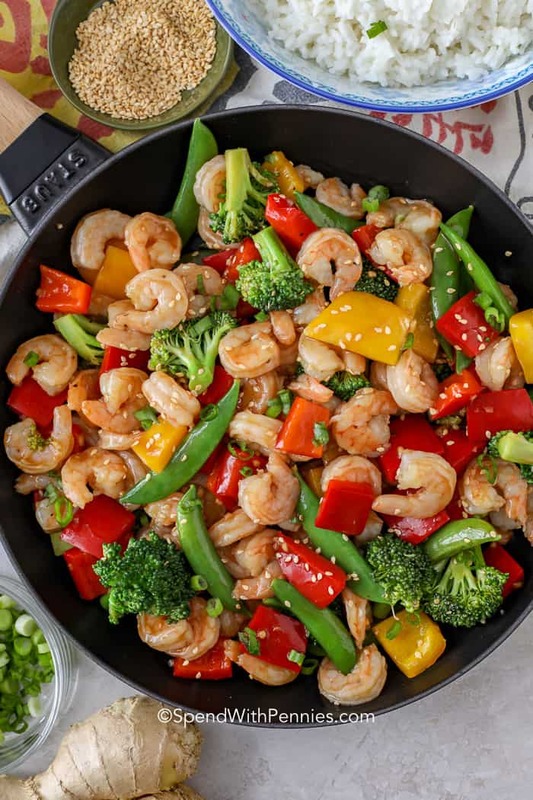 Shrimp Stir Fry is a quick and healthy meal that everyone loves! 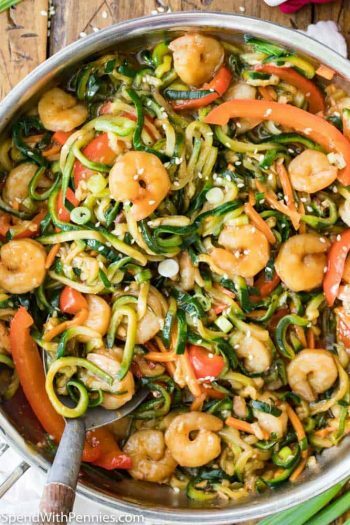 Loads of ginger and garlic, fresh veggies and juicy shrimp are tossed in a simple delicious stir fry sauce. Prep your veggies ahead of time for a quick weeknight meal. 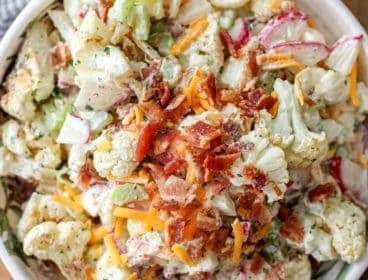 Serve this stir fry over a bowl of fluffy rice or your favorite noodles (or even Cauliflower Rice for a great low carb option)! 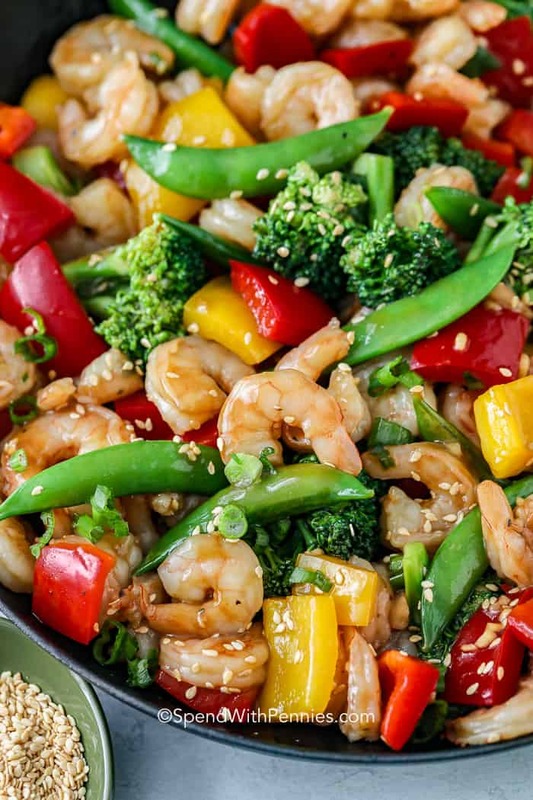 Everyone loves a healthy stir fry including this easy shrimp recipe! Nearly every stir fry recipe can be changed based on what you have on hand! To make prep faster, check the produce area in your grocery store, many stores carry fresh chopped stir fry veggies. Vegetables: Use whatever vegetables you have on hand. Remember to cook harder veggies (like carrots) a little bit before adding the softer veggies (peppers & mushrooms). 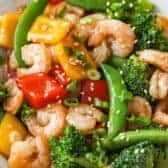 Protein: Add extra protein for a chicken and shrimp stir fry or go light on the protein and make a healthy and crunchy shrimp and broccoli stir fry! Flavor: How spicy do you want it? This easy recipe even makes the best shrimp stir fry sauce that you can spice up any way you want to! 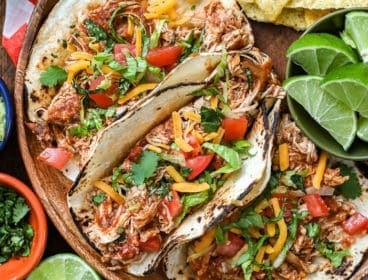 A dash of chili flakes or sriracha adds a bit of heat. 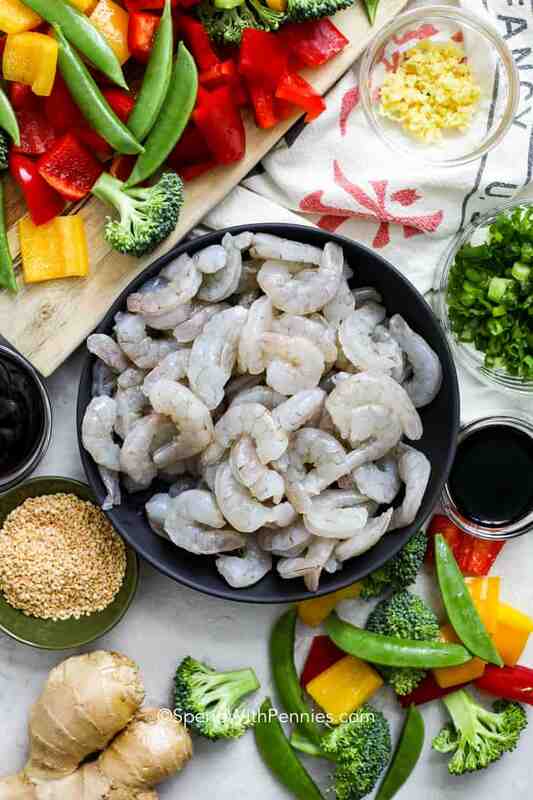 It’s so easy to toss together, just a bag of frozen shrimp and mixed vegetables and dinner is ready in no time at all! 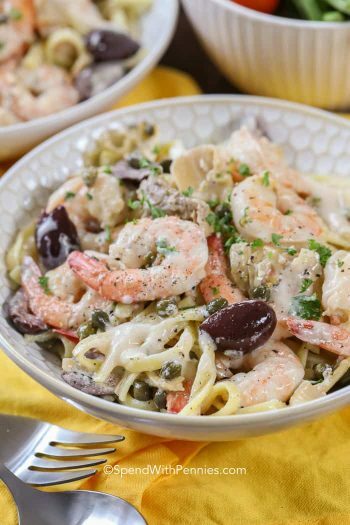 You can buy precooked frozen shrimp, but I prefer raw for this recipe and they literally take minutes to cook. 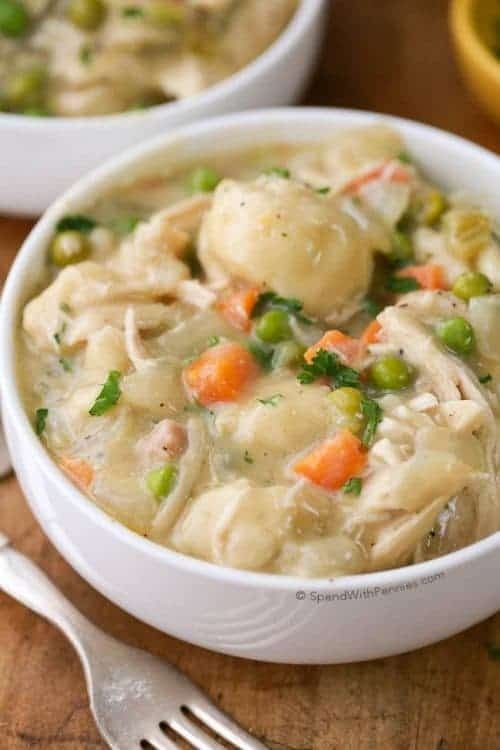 Whether it’s precooked or raw, take it out of the freezer and place it in a bowl in the fridge so it thaws naturally or run under icy cold water (not warm) just before cooking. Putting frozen shrimp in the microwave to defrost is not recommended. How to Devein Shrimp: If you are using fresh, raw shrimp, deveining them is a cinch. Most shrimp is already scored across the back spine so all you have to do is separate the shells, grab by the legs and gently pull the shell off. Take the tip of paring knife and gently lift up the black intestine, it should come out in one piece. Rinse and set aside. Some people think leaving the pink tail on is more attractive, but I’d remove it if you are serving shrimp stir fry to kids. It just makes the stir fry easier to eat. 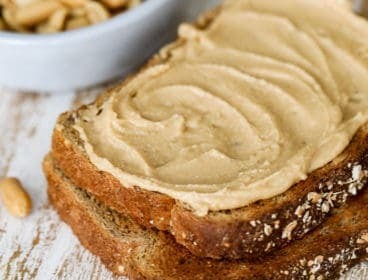 Truly one of the easiest meals ever! 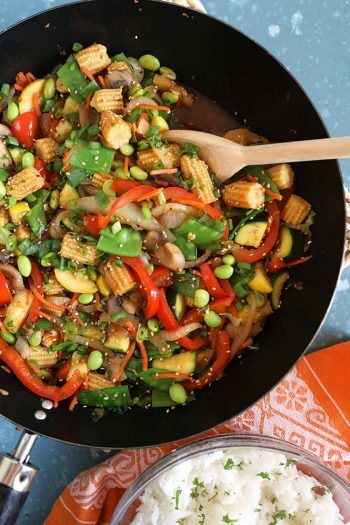 We prep the veggies ahead and can make this stir fry recipe faster than the rice cooks! Prepare the sauce first and set aside. Gently saute shrimp until they just turn pink. 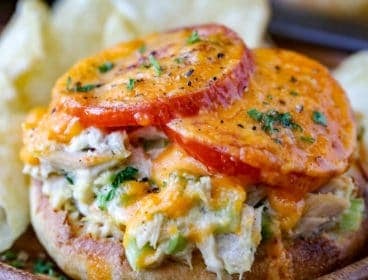 They’ll cook a little bit more when combined with the sauce so be sure not to overcook them. Remove and set aside. Stir Fry the veggies (I chose broccoli and peppers but you can use whatever veggies you want). Add the shrimp and sauce and cook a few minutes until bubbly. Season with salt and pepper to taste. If you have leftovers, chop them up and make an easy fried rice the next day! 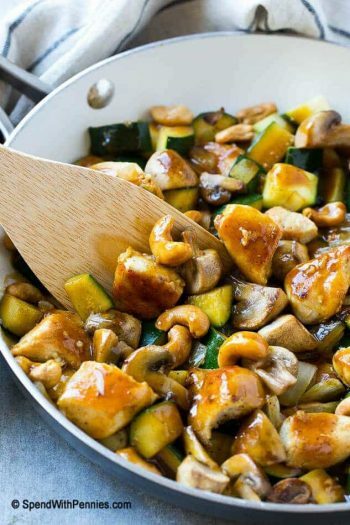 Cashew Chicken Stir Fry – Better than take out!! Stir Fry Veggies – Healthy and easy! Beef and Broccoli – Classic stir fry combo! 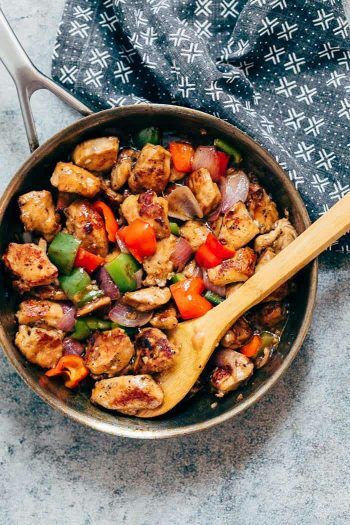 Easy Pepper Chicken Stir Fry – Easy weeknight meal. Easy Mongolian Beef – Reader favorite!! 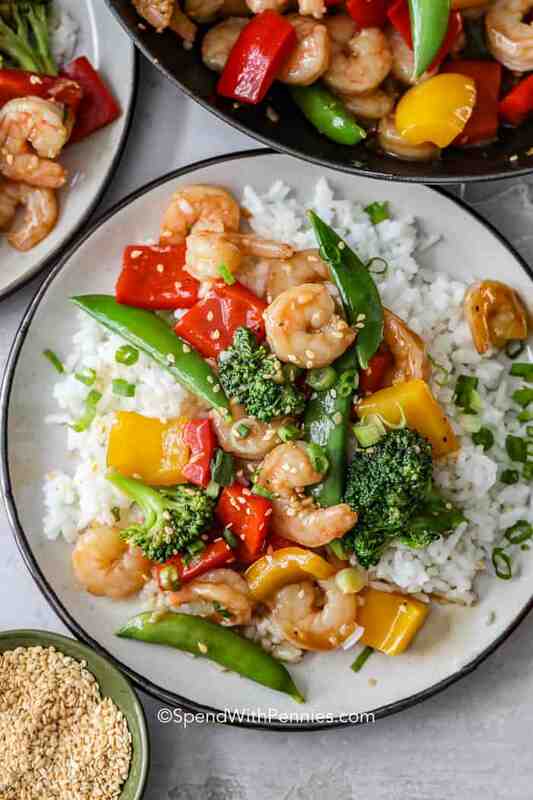 Shrimp stir fry is an easy weeknight meal filled with fresh veggies and tender shrimp. Heat 2 teaspoons oil over medium heat in a wok or frying pan. Add shrimp, salt and pepper. Cook just until shrimp turns pink, about 2-3 minutes. 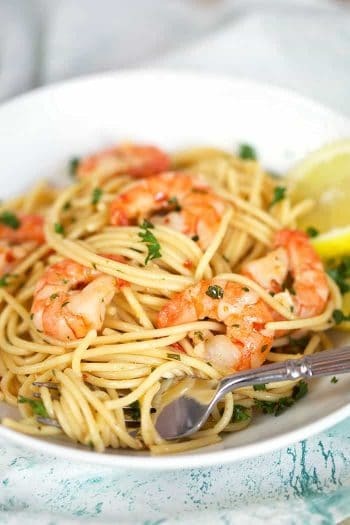 Remove shrimp from the pan and set aside. Heat remaining 2 teaspoons vegetable oil over medium high heat. Add the vegetables and cook until tender crisp, about 3-4 minutes. 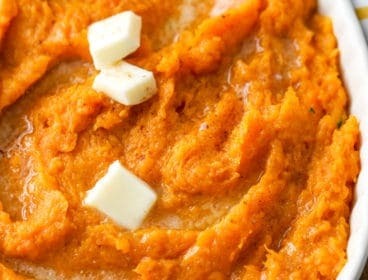 Add the garlic and ginger and cook 30 seconds more. Stir in shrimp and sauce cook over medium high 1-2 minutes or until sauce has thickened. Im a busy caregiver and was off work tonight so I fixed this. 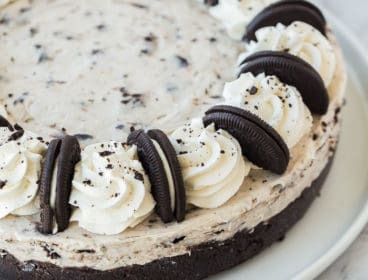 OMG it was awesome. I’m so glad you loved it Theresa!